Texture painting is a hit every time! Find a few objects that have – or can be used to make – a shamrock shape and start experimenting. Did you use potatoes to paint as a kid? I did – and I still remember it as a fun, funky thing to do! Since my trio love to paint and love to get their hands dirty, I thought some textured painting fun would be a great St. Patrick’s Day craft. We gathered our supplies, our green paint, and off we went! 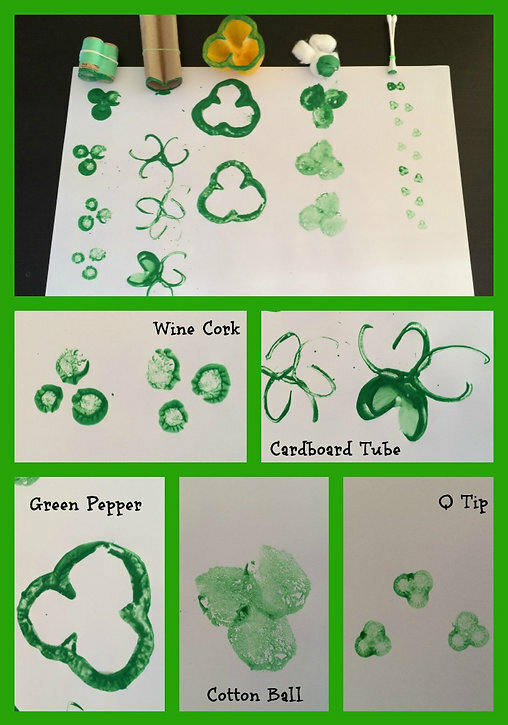 It was fun to have the kids guess what items they thought would make a great shamrock shape before we started and then compare the results. I was sure the green pepper would work well, and I had high hopes for the wine corks. I ended up pleasantly surprised by the cotton balls.